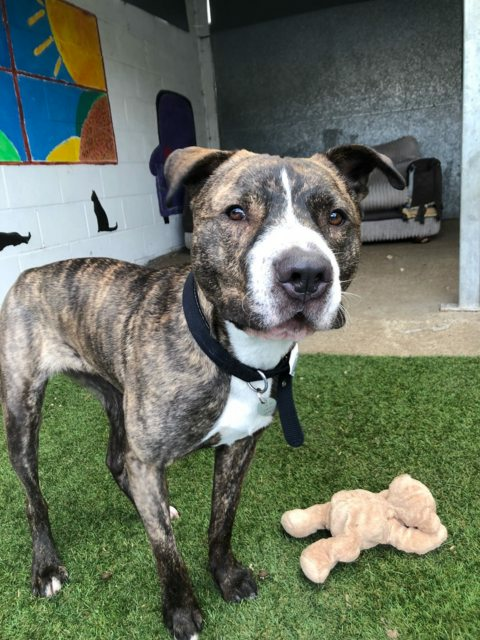 Hey, ‘Loki Locomotion’ here and I am 18 month old male Cross-Breed. Ijust like my name I am a follower and do love to be with people. I love travelling and do enjoy spreading myself across the seat and relaxing, it’s great when you can be chauffeured around! I do find it a lot easier to have my food scattered about as it happens to roll out occasionally due to my undershot lower jaw, plus it keeps me entertained! Now, I am a big puppy so do expect to have your knee sat on and I love a cuddle at night time whilst we watch the soaps. My Kennel Mum Holly says I am very cheeky and a real character and very entertaining. I think a home without children is the one for me because I’m clumsy and silly and want to be the only ’Big Kid’ in the family. Also I’m not very confident sometimes and get worried by strange sounds and unfamiliar situations. I could live with a compatible dog as long as they are quite steady and calm as my knees are not robust and I will require, steady on lead exercise to prevent pain and discomfort. The Charity will fund my pain relief and vet checks so you don’t need to worry about vet bills. He is neutered, vaccinated and microchipped.